Over 1600 fire fighting questions online with answers, rationale, instant grading and a detailed exam tracking system that lets you evaluate and review any exam at anytime! Questions Based on Current Curriculums from National Standards! If you are studying for your written firefighter exam then we have the practice tests, study guide and preparation materials that will give you the edge you need to pass. Our fire fighting questions and study guide are written by a staff of Nationally Certified Firefighters with over 40 years of experience and this experience is included in our examinations. Each question is based upon the NFPA 1001 Standard for Fire Fighter Professional Qualifications. This national standard is used by most fire departments to certify at the Firefighter 1 and Firefighter 2 levels. Study guides for department exams are traditionally published as books. The problem with books is that they are static and are not able to give you feedback. With our study guide and practice tests you get data back about how you are progressing. The fire fighting database that we have created is an essential study guide for those taking their written firefighter 1 or 2 exams in the near future. It's quick and easy. Just login, choose the category. Choose the number of questions from 10-20...click a button and your online exam is created, ready to be taken and instantly graded. It's that easy. Our program also contains detailed cumulative scoring and test tracking that allows you watch your progress during your subscription. Testing to become a firefighter can cause a great deal of stress. 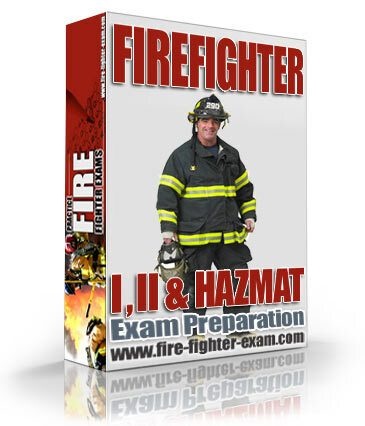 Build your confidence and fire fighter knowledge with our system of practice written exams and you can eliminate a great deal of the stress associated with testing.Take the opportunity now to better your weak areas of knowledge and fine tune the things you are already strong in. Register today for our practice firefighter exams or take a more detailed quick tour.